Gridded climatic datasets with fine spatial resolution can potentially be used to depict the climatic characteristics across the complex topography of China. 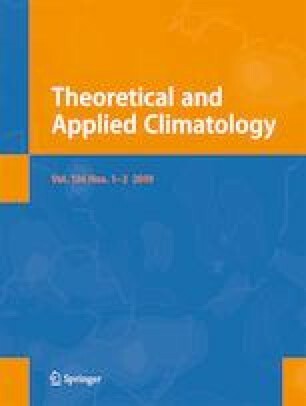 In this study, we collected records of monthly temperature at 1153 stations and precipitation at 1202 stations in China and neighboring countries to construct a monthly climate dataset in China with a 0.025° resolution (~ 2.5 km). The dataset, named LZU0025, was designed by Lanzhou University and used a partial thin plate smoothing method embedded in the ANUSPLIN software. The accuracy of LZU0025 was evaluated based on three aspects: (1) Diagnostic statistics from the surface fitting model during 1951–2011. The results indicate a low mean square root of generalized cross validation (RTGCV) for the monthly air temperature surface (1.06 °C) and monthly precipitation surface (1.97 mm1/2). The method used variable square root transformation for the spline surface fitting to reduce positive skewness in the measured precipitation values and no variable transformation in air temperature case. This indicates that the surface fitting models are accurate. (2) Error statistics of comparisons between interpolated monthly LZU0025 with the withholding of climatic data from 265 stations during 1951–2011. The results show that the predicted values closely tracked the real true values with values of mean absolute error (MAE) of 0.59 °C and 70.5 mm and standard deviation of the mean error (STD) of 1.27 °C and 122.6 mm. In addition, the monthly STDs exhibited a consistent pattern of variation with RTGCV. (3) Comparison with other datasets. This was done in two ways. The first was via comparison of standard deviation, mean, and time trend derived from all datasets to a reference dataset released by the China Meteorological Administration (CMA), using Taylor diagrams. The second was to compare LZU0025 with the station dataset in the Tibetan Plateau. Taylor diagrams show that the standard deviation derived from LZU had a higher correlation with that produced by the CMA (R = 0.76 for air temperature, and R = 0.96 for precipitation) compared to those from other datasets. The standard deviation for the index derived from LZU was more close to that induced from CMA, and the centered normalized root-mean-square difference for this index derived from LZU and CMA was lower. A similar superior performance of LZU was found in the comparison of mean and time trend derived from LZU and those from other datasets. LZU0025 had high correlation with the Coordinated Energy and Water Cycle Observation Project (CEOP)—Asian Monsoon Project (CAMP) Tibet surface meteorology station dataset for air temperature, despite a non-significant correlation for precipitation at a few stations. Based on this comprehensive analysis, we conclude that LZU0025 is a reliable dataset. LZU0025, which has a fine resolution, can be used to identify a greater number of climate types, such as tundra and subpolar continental, along the Himalayan Mountain. We anticipate that LZU0025 can be used for the monitoring of regional climate change and precision agriculture modulation under global climate change. We thank the editor and two anonymous reviewers for their constructive comments, which have led to improvement of this manuscript. We also thank our previous colleague Zhiping Long for providing the NCL code about dataset comparison. This work was jointly supported by the National Natural Science Foundation of China (NSFC) (Grant No. 41790421, 41877446), and Fundamental Research Funds for the Central Universities (Grant No. lzujbky-2018-140).